After selling this hunting tract, the buyer asked me what I would do to improve the property. 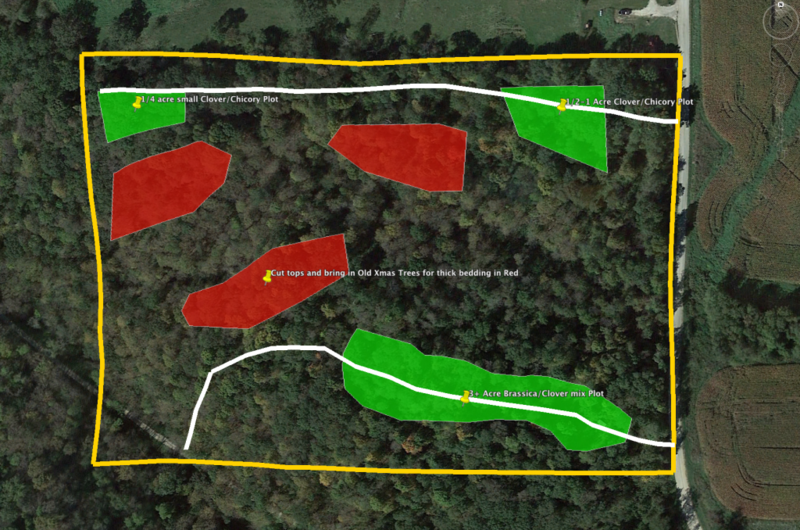 I put this plan together for him, the green areas will be future food plots. The biggest plot to the south will be the late season plot to help hold deer through the winter months. The other two will be early season staging plots to the larger food plot and to the major grain food source to the east. The largest food plot will be planted with brassicas this year and will have brassicas and soy beans next year when he has the growing period needed. The smaller staging plots will be planted with clover and chicory. The red areas marked on the map are where the new owner will go in and cut down some tree tops and add thick cover with old Christmas trees and other things to help make those prime bedding areas. Also, not shown he will add a small watering hole in the wash running through the middle of the property. The property already has great deer and turkey traffic for 20 acres but this should really help pull some big bucks to the property.